Why I Picked This Book: Rita from View From My Home has spoken highly of this series and I love a good romantic suspense. My Impression: It seems like every year around this time I get really restless when it comes to reading. It's not really a rut but more of an inability to settle on a book. I think it's my brain's reaction to all the stuff that seems to crop up at the end of the school year coupled with the fact that now that school is out my days are a lot more chaotic. 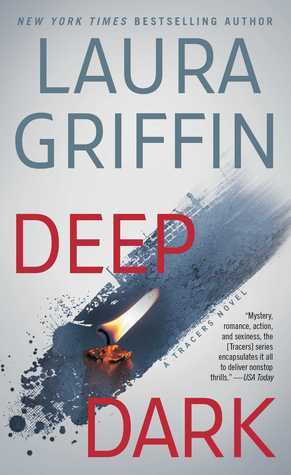 But every year I find a book that knocks me right out of that mood and this year Deep Dark by Laura Griffin just might be it. Right from the start I was yanked into the book as we start out with an attack on an unnamed character and the pacing really doesn't let up. I really enjoyed getting to know Laney, Reed, Veronica, Jay and Jordan. I liked that they all come off as real people with regular problem and that the women connected with the police department read so realistically. Laney is brilliant at coding and very guarded but not overly prickly. She's hard to get to know and doesn't always know what she wants but has her own code of morals that she lives by. Reed Novak.is a good detective and does a good job of walking the line between out of the box and by the book. His feelings about his developing relationship with Laney rang true and I loved how considerate he was even when he came off as a little overbearing. The mystery itself is a page turner! I had know idea how it was going to wrap up but I couldn't wait to find out. Laney does wander over into To Stupid To Live territory a few times but it fits with her reckless and impulsive personality so well that it didn't bother me. Don't let the fact that this is the tenth book in the series scare you away. This is the first book in the series that I've read and I had no problem keeping up with what was going on and who everyone is. From reading the blurbs of the other books it sounds like the main characters change from book to book as well. This is a perfect read when you're looking for something that pulls you in and keeps you reading late into the night. You just may want to double check your locks before you start! Would I Read More of this Series/Author? : Definitely! I'm really excited to be coming into the series so late because there is a sizable backlist to get caught up on! Would I Recommend this Book? : Absolutely! If you're in the mood for a good romantic suspense (or don't mind a dash of romance in your thriller) than don't pass this one up! I love a good romantic suspense. Sometimes I don't mind when a character is TSTL a little. Like, not all the time, but once in awhile. If I'm really enjoying the book otherwise, I'm willing to go with it. I'm so glad this book got outta your reading funk. I haven't read this author yet, but her books sound like books I'd enjoy. Oh I love romantic suspense. This sounds really good and love that it was a page turner. Not sure how I have not heard of this one before!! Great review! Anything that makes me check the door or scowl when I hear a noise at night is a good read! I like suspense like that. Glad this one was good! I've heard some good things about Laura Griffin and have bought one of her books but yet to read it. Glad you enjoyed her and hooked you in. Mystery, suspense and a little romance? Sounds perfect. I've been in a reading and blogging rut lately. This sounds like a good read so I'm adding it to my list to read. To Stupid to Live, lol. There's too many of those out there. At least she didn't piss you off. I believe everything needs romance. That's my motto. I need some swoon. I've been trying to read more suspenseful reads. BTW, you should check out The Naturals by Jennifer Lynn Barnes. You'll love the series. I haven't yet read this author, but I have this one bookmarked on Amazon...so I absolutely must download it. Soon! Thanks for sharing. YAY so glad you enjoyed this as much as I did Katherine. I have been enjoying this series. I received this book from the publisher and I am trying to get over my stickler for wanting to start from book one. I know they are stand alones but just like Krewe of Hunters I had to go in order...lol. I haven't read this series, but it sounds really good. I like it when a book pulls me in right away. Those are the kinds of books I've been attracted to the most recently. Definitely adding this title to my list!